This electronic exhibit is based on the exhibition of the same name, which opened at the Chilliwack Museum and Archives in May, 2013. 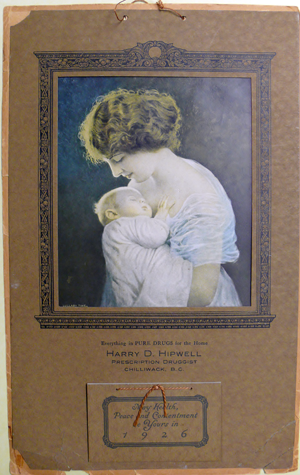 The title: “May Health, Peace and Contentment be Yours”, was inspired by a 1926 Hipwell Drug Store calendar from Chilliwack bearing this inscription. We hope you enjoy the exhibit, exploring healthcare in Chilliwack as we travel through the wheel of life. Throughout our lives we strive to take care of our bodies, minds and souls. However, over our lifetime we can suffer injuries, illnesses and traumas that remind us of our vulnerability. The wheel of life turns for all of us. Our exhibit represents this path and on our journey today we will encounter items integral to this passage of time we all knowingly endure. May health, peace and contentment be yours.